Currently, the captions only work on computers, including PCs and iPads. Netflix says it is working on captions for its game console, Blu-ray, and DTV platforms, which will roll out in releases starting this fall, along with support for 5.1 audio. Netflix offers a flat rate movie-delivery service but as more content is moving online, Netflix has been under pressure to use technology that will caption streaming TV and web content. One particular hang-up for the deaf community is with game consoles, such as PlayStation 3 and Nintendo Wii, which gives Netflix subscribers free access to instant movie libraries — but without captions. A Facebook group, Netflix Watch – Instantly Needs Closed Captions, has nearly 3,000 members who are anxiously awaiting streaming captions. Netflix has said in the past that the problem lies with both the movie studios’ inability to produce the captions as well as complications with Microsoft’s Silverlight player, which has a program for creating captions. 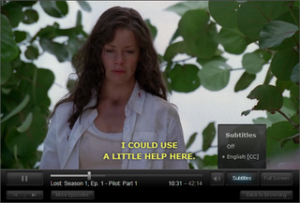 Still, many web developers say Silverlight is compatible with captions and that Neflix has been stalling due to the daunting task of transcribing its library of more than 4,000 titles. Another vocal group, CaptionAction2, is pushing for passage of the Twenty-First Century Communications and Video Accessibility Act of 2009 (H.R. 3101). It would require all captioned TV programs on the Internet to be shown with captions for the deaf and audio descriptions for the blind. The Federal Communications Commission is also looking into making broadband more accessible for the 54 million Americans with Disabilities. Already, Hulu, which is owned by NBC Networks, and ABC Networks’ online division, have said they will work to caption most, if not all, of their long-form programming.